The Zero Friction Future (ZFF) programme aims to define, understand and mitigate friction in consumer purchase journeys to unlock business growth with use of mobile in media. Consumers prefer to follow the path of least resistance and avoid anything that makes it challenging for them to move to the next step or make a purchase. 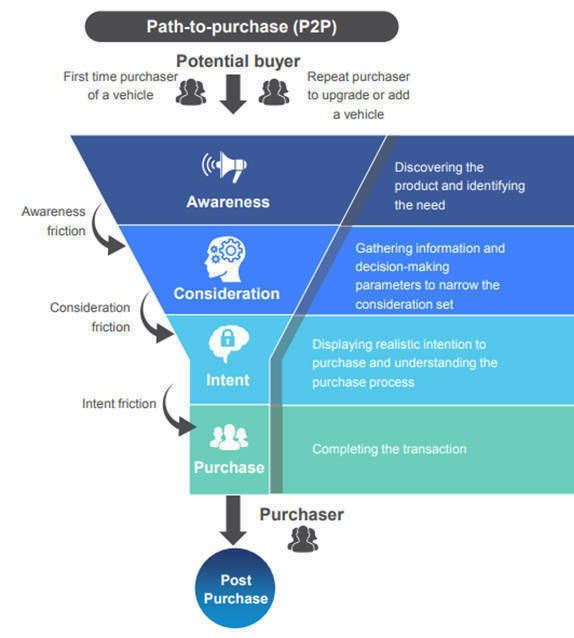 The traditional path to purchase has transformed with the advent of technology, smartphones and digital assistants, and is likely to be replaced by personalised journeys. Any unnecessary additional effort, incremental step or inconvenience which leads consumers to abandon their purchase journey is defined as friction. Consumer pain points that lead to friction can occur across three main stages of the consumer journey: awareness, consideration and intent. Covering all these aspects for the automobile industry, the report titled "Eliminating Friction in Automobile Path to Purchase" is the second in a series of the ZFF reports. The first report was aimed at the smartphone industry. Eliminating Friction in Automobile Path to Purchase identifies the opportunities where mobile intervention could reduce this friction in the automobile industry. The reports are authored by KPMG in India, based on primary research and insights based on the survey conducted by Nielsen for various industry verticals, and commissioned by Facebook. To understand the peculiarities of the automobile purchase journey and associated friction at its different stages, a survey was conducted by Nielsen India among 3,987 respondents in the automotive category across varied demographic and socio-economic groups. KPMG in India, also interacted with industry experts to obtain their perspective on the possible approaches to reduce friction and improve upon the conversion rates. The report states that India has emerged as one of the world's largest and fastest growing automobile markets over the years, with production of 29 million vehicles in FY18 and an estimated production of about 60 million vehicles by 2022. It is also the leading manufacturer of two-wheelers in the world and a global hub for small cars, contributing approximately 30 per cent of the global small car sales. Four-wheelers: While a woman customer expects sales assistance, men demand swift response from the brand and dealers. Two-wheelers: Men seek technical assistance, while women seek clear communication of offers during a purchase. Two-wheelers: Prospective buyers between 25-34 years of age are the most likely to make a successful purchase, with a conversion rate of 50 per cent. But they also seek the most information about the product throughout the journey. The 18-24 and 35-49 age groups rely more on expert advice and also prefer physically testing the product before deciding. Four-wheelers: An NCCS-A classified person is 10 times more likely to purchase a four-wheeler than an NCCS-B person. Both groups, however, follow a very similar purchase journey seeking the same information. Two-wheelers: NCCS-A prospects are over five times as likely to complete two-wheeler purchase as NCCS-B ones. The latter group also values targeted information and response from the brand more than finance support. You can read the full Zero Friction Future report here.